Spread the flat side of 12 wafers with 1/2 teaspoon raspberry preserves each. Crumble remaining wafers and set aside. Place five wafers each around the edges of two dessert dishes, preserve side facing in. Place one wafer in the bottom of each dish, preserves side up. 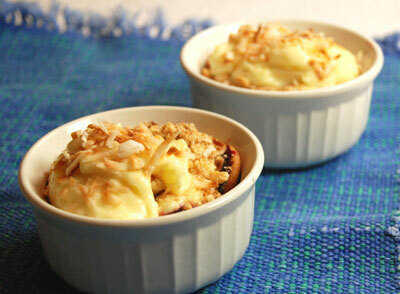 Spoon vanilla pudding in the center; sprinkle with wafer crumbs and half of the coconut. Top with tapioca pudding and remaining coconut. Cover and refrigerate at least 3 hours.